Updated few minutes ago – This post will guide you through on How to download and install stock firmware for all models of Samsung Galaxy S7 phones. Some of the models include; (SM-G930F /SM-G930A/SM-G930P/SM-G930R4/SM-G930T/SM-G930V/SM-G930W8/SM-G930U/SM-G930F/SM-G930K/L/S). With this guide, you will be able to learn how to fix soft bricked Galaxy S7 and get back to your device stock Rom, if you know what I mean. 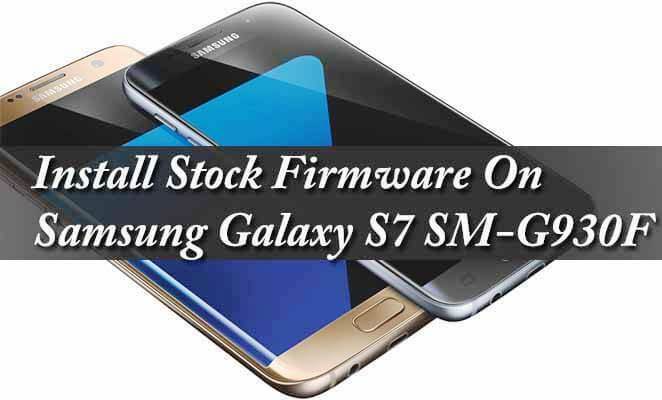 Now, you are required to follow the below step meticulously in order to achieve the aim of installing a stock firmware on your Samsung Galaxy S7. And also restore any Samsung Galaxy S7 all models, to stock firmware / ROM. As you may know, Samsung company released some awesome flagship devices, which are called Samsung Galaxy S7 and S7 Edge. Here are some specs review of Galaxy s7 and S7 Edge. The device is powered by an Octa-Core Snapdragon 820 or Exynos 8890 and Adreno 530 GPU, with exactly 4GB RAM and a whooping internal memory space that goes for 32/64 GB. The phones are embedded with a 12MP rear-facing sensor with an aperture of f/1.7 The front facing camera of Samsung galaxy S7 and S7 Edge is 5MP. The device runs the latest Android Marshmallow 6.0. Am rating these two devices for now, as the best Android phones one should go for in the market. Don’t know about you, as in, how you are rating the device. Do you own Samsung Galaxy S7 G930F and want to install the stock Android Marshmallow 6.0 Firmware, you are at the place for that. So stay focused as I guide you through with a one touch direct link to download Samsung Galaxy S7 SM-G930F Stock Firmware. Ensure you Charge your device More than 50% battery before proceeding. · Backup your important Data. Download Samsung Galaxy S7 Stock Marshmallow 6.0.1 Firmware from the above provided link. >> How ToFlash Or Install A Stock Firmware Using Odin Tool. That’s all for that. Hope it works for you? If you have any contribution or question regarding to this post, please kindly share using the below comment box. Don’t forget to share with friends on your social media platforms. Thank you.